Our Build-A-Flower Camellia set includes 1 6x8 stamp set (7 stamp images) and 1 coordinating die set (2 dies). Queens of the winter flowers, Camellias are highly prized for the beauty of their exquisite blooms, their splendid evergreen foliage, and their compact shape. These blooms can reach up to 5 inches and range in color from pure white to soft pink to dark red. 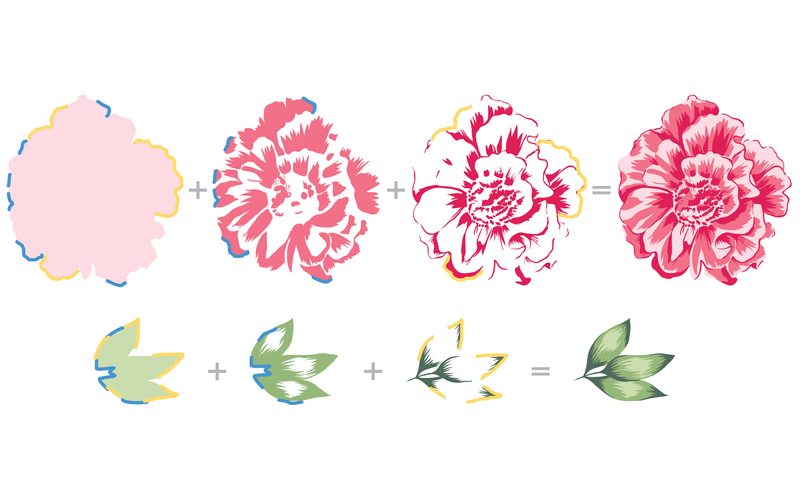 Camellias have many forms, and the one featured in this set has peony-form blossoms. It is perfect for adding a dazzling touch to any paper crafting project. Dimensions: The largest die measures approximately 3.27" x 3.56" while the smallest die measures about 1.72" x 2.04". This is one of my favorite flowers, I have always loved them. I am having so much fun with using a variety Altenew Ink Pads, traditional floral color and non traditional. I am so in love with these beautiful stamps that I ordered them in bulk now. Every product is unique and marvellous. The most beatiful flower. Great detail and lovely leaves. I had been playing with this stamps this week and the results are wonderful. I must say, I've always liked the build a flower concept, I collected a few - and now I've joined the subscription. This stamp creates beautiful layers that makes it look like I'm somewhat of an expert! All I have to do is line it up and stamp. These layering stamps really do make it easy. In this stamp I've only used the second and third layers on a project. It stamped perfect.